Looking for some fundraising ideas for your school or for your non-profit organization? Let The Distillery be a part of your organization's fundraising effort and we will help you raise money for your worthwhile cause. The Distillery proudly supports the communities in which we operate! Sign up for our Dining for Dollars FUNdraising Program and The Distillery will donate 20% of the participants' total food bill (excluding tax and gratuity) to your organization. It's a great way to raise additional monies for schools, sports programs, charities and religious groups. 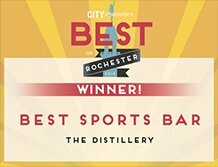 Schedule your next FUNdraiser with The Distillery and we will take the work out of fundraising and put the FUN back in. 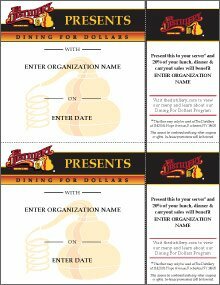 For details about our Dining for Dollars FUNdraising Program, complete the information request form and a Distillery representative will respond promptly. Group members, their supporters, neighbors, family and friends, can dine at the designated Distillery on the scheduled day of their event, present the fundraiser card provided and we'll do the rest. Dine at The Distillery that is holding your event on the date of your fundraiser. At The Distillery "It's All Good Here" for you and your next FUNdraising opportunity!